Crowdfunding is big. Crowdfunding platforms like Kickstarter, which in 2012 raised over US$300 million from more than two million funders, and Indiegogo are spreading throughout the world. In early November 2013, the US Securities and Exchange Commission proposed over 500 pages of regulations on crowdfunded activities. It is time to ask ourselves whether crowdfunding has potential as a feminist form of investment. And would regulation of public equity crowdfunding be a help or a hindrance to supporting women and gender equity. The gender numbers: According to Forbes, (October 2013) 42% of Indiegogo’s successful campaigns are run by women. And these women get more contributions and raise more money per campaign than their male counterparts. In a recent academic paper, “Swept away by the crowd?,” Ethan Mollick of the Wharton School compared crowdfunding by Kickstarter to conventional venture capital funding. He found that women’s projects are not only fifteen times more likely to be funded through crowdfunding than through venture capital but that crowdfunding supported a higher ratio of women’s projects than men’s or mixed ones. The gender dimension: Women are very good in using social media. By making their projects known with pictures, videos, and personal backgrounds, they can use their Facebook, Twitter, and LinkedIn accounts as powerful channels for raising money. The care economy dimension: A case study of crowdfunding in the Netherlands shows the multiple returns of crowdfunding in supporting the care economy. 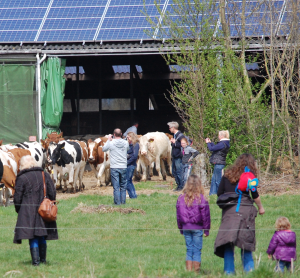 Solar panels (costing 250 euro for an organic family farm cow shed) provide an annual return of 3%, with additional savings going to funder–consumers, who can purchase farm products at farm-gate prices, 30% lower than organic shop prices. Together these provide for a 33% annual return on investment. An additional care economy return is the connectedness of consumers with the origin of their food: you can stroke the cow when you pick up your products and interact with the land by collecting hay or cutting branches, PLUS get invited to the annual spring event when dancing cows are brought out of the shed to the land. Another care economy dimension is low investment risk. The consumers form a potential pool of voluntary labor and management advice to draw upon in case the farm needs help. The farmers pay back in products, which saves them cash, provides some stability to their annual sales, and reduces average production costs. So, this crowdfunding project has a built-in safety net. De Beekhoeve farm. Photo courtesy of Monique van der Laan. A win-win-win for promoting feminist goals? Crowdfunding has great feminist potential, next to conventional forms of finance. It serves women’s needs, it draws on women’s social strengths, and it strengthens the care economy with positive externalities for the economy as a whole. For more information, see: Irene van Staveren, “Caring Finance Practices,” Journal of Economic Issues 47 (2), 2013, pp. 419-425.